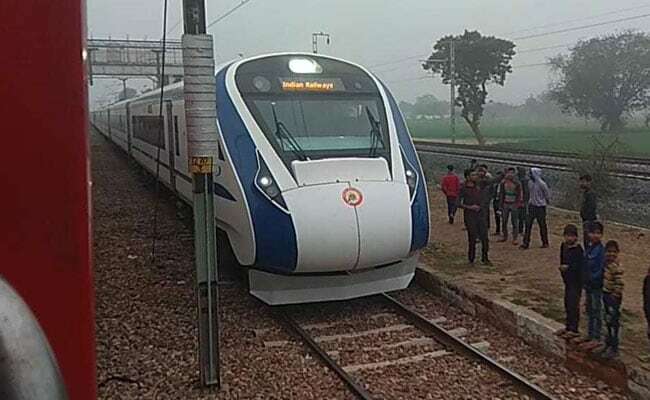 India's first engine-less train Vande Bharat Express, or Train 18, reached Delhi this afternoon, travelling at a much slower speed. There were no signs of damage on the front of the train Vande Bharat Express this morning. Vande Bharat Express, India's fastest train, broke down this morning, a day after its launch by Prime Minister Narendra Modi in Delhi. The train, on the way back from Varanasi and travelling at a much slower speed than usual, reached Delhi in the afternoon. The Railway Ministry has attributed the disruption to a possible cattle run-over. However, there were no signs of damage on the front of the train. The engine-less train, formerly known as Train 18, was returning from Varanasi after its inaugural run and broke down about 200 km from the capital at around 6 am. It resumed its journey after almost 2 hours at around 8.15 am before coming to a halt again at 8:55 am. After necessary repairs, it resumed its journey towards Delhi. The train had to be brought to Delhi to fix the fault and it cannot be driven above 40 km per hour for now, sources said. The people on board, mostly railways officials and journalists, were shifted to another train. The train is expected to start its commercial run tomorrow. At around 5 am today, the power went out in some coaches on the train. Before coming to a halt at Chamrola station, the Vande Bharat Express had slowed down to a sluggish speed of 10 km per hour. There was also a foul smell and mild smoke which was due to an internal system failure. Due to a deposit in the wheels, the braking system was jammed. Calling it a "mechanical fault in the braking system" the staff said the train made thumping noises when the speed was increased. According to the train staff, the fault had led to the control failures of the air-conditioners.